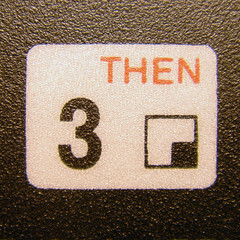 Quasimondo has a beautiful set of macro photos of the ZX81’s keyboard. I was only a kid when my father brought one home. The ZX81 is the first computer I ever used and I have fond memories of it. We used the 16K expansion kit which expanded our computational horizon to unthinkable length, like painting the screen black! The standard 1K would only let you paint about half the screen before running out of memory! The keyboard was really unpractical so we used a mechanical keyboard laid out on top. This improved the ergonomy slightly. Slightly is the key. My father also built a wooden cradle to protect the beast and dramatically improve its stability. Indeed, without it, even a light impact on the table would reset the machine. I am the very proud father of two adorable monsters who have turned my life upside down, for the better! Sophie, the eldest, will turn three in a couple of days while Noah, the wee one, celebrated his first birthday a few weeks back. As the saying goes: we’ve got our hands full . I’m eternally grateful to my wife, Noreen, for giving them the greatest gift of all: life. I play the saxophone in a Blues & Rock band called Delta Creed. We play a couple of times a month in pubs around Dublin. I have worked for one year as a clarinet teacher in a music school, about fifteen years ago. Oh boy… poor kids. My father’s parents where Italian. My mother was born in Algeria. I am French. My kids are French and Irish. If everything goes according to plans, the next generation should invade Iceland! One thing you surely know about me: I have been neglecting my blogging duties for far too long. Thanks you, Jao for giving me a jolt to start writing again. Time to pass the baton to: Abhijit Nadgouda who has to be my most fervent reader, Coté from the inimitable Drunk & Retired podcast, Fintan Palmer a friend, Steve Dekorte father of Io, and Geoffrey Grosenbach from the Ruby on Rails podcast, the peepcode screencasts, etc. You know the drill: five facts, five more people and do not drop the baton!